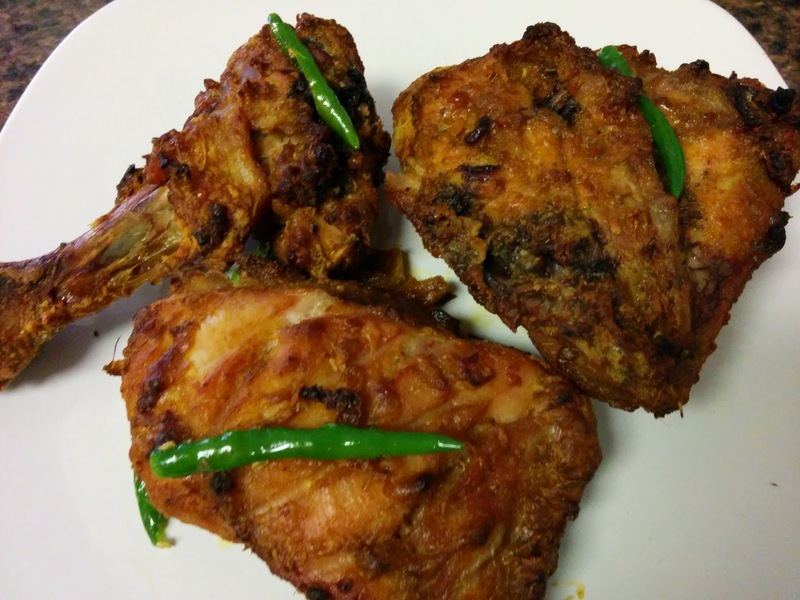 Tandoori chicken is traditionally made in the tandoor, but it can be easily prepared at home in the oven.Do try this flavorful Restaurant-Style Tandoori Chicken in the Oven! Wash chicken, make slits on the chicken using a sharp knife. In a bowl mix yogurt, turmeric powder,oil, chilli powder, coriander powder, cumin powder, garam masala, ginger garlic paste, salt, food color and lemon juice. Apply this mixture to the chicken pieces on all the sides using your hands. Place the marinated chicken pieces in a bowl or plastic bag and keep inside in a refrigerator for 2 to 3 hours. When you are ready to cook, take the chicken out of the refrigerator.Preheat the oven to 425 F.
Prepare the baking tray by covering it with silver foil . Place the marinated chicken pieces on the silver foil covered baking tray. Once the convection oven is hot, put the pan with the chicken in the convection oven. Turn the chicken pieces once after 30 minutes of cooking time, turn it to the other side and bake for another 15 to 20 minutes. NOW TURN THE OVEN OFF, and let the chicken rest in the oven for 20-30 min's. Remove from the oven and garnish with Sliced onions,Sliced lemons and Cilantro. Please follow my blog and give your valuable comments and suggestion.Your commnets are most precious to me. Thank you very much.